This was the stuff of Indian football nightmares, as the team produced their worst display of the tournament. The last time that India were defeated by Bahrain at the Asian Cup, it was a 5-2 thrashing and India were knocked out of the tournament after the match, having lost their two opening games. On this occasion, it wasn’t as much a mauling as a sucker punch, a quick jab to the guts flooring India and their aspirations of progressing to the Round of 16. Or was it? Did Bahrain deserve to lose the game at all, based on India’s shambolic build-up play and kamikaze passing? Forlorn expressions on the bench may have indicated surprise at the end of the match, but this was a mess all of India’s doing. A late goal from Bahrain dent the Indians' qualifying hopes to the next round of the #AsianCup2019. For the first time in a long while, two adrenaline-filled showings had the Indian football community stand up and take notice. As it turned out, that was as high as the roller-coaster got before crashing down to the ground. The players, visibly tired at the end of the last match against UAE, were noticeably upbeat while discussing the Bahrain game with talk of a win dominating airwaves in the build-up. The result and the manner in which it came about, did little to justify that optimism. The Blue Tigers’ performance on the day was the stuff of proper Indian football nightmares. It started with Stephen Constantine’s selection of Rowllin Borges in place of Anirudh Thapa, a move that was possibly meant to combat Bahrain physically and to plug gaps. Keeping the ball proved to be too much of a task for the eleven in blue, as those in white choked and dominated the match from start to finish. Sloppy passes in midfield, aimless punts down the line and a combination of fear and unwillingness to play the ball culminated in a chasing of shadows. 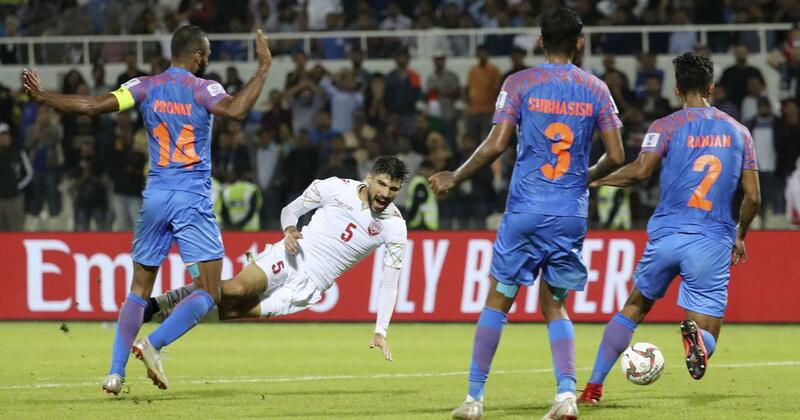 Bahrain coach Miroslav Soukup would acknowledge after the match that he was relieved on seeing Borges in the side rather than Thapa, and knew at that very moment that India would heavily rely on the long ball. One might argue that Thapa may have stabilised the midfield. The flip-side of that argument is that the ten outfielders out there should have kept it better. There was a trepidation when the ball approached, and a disjointed display followed. The start wasn’t auspicious with Gurpreet Sandhu shaky and Anas Edathodika substituted. Pronay Halder and Sandesh Jhingan played to keep Indian heads above water, but such was the lack of an out-ball that Stephen Constantine’s men were penned in for large periods. The second half witnessed more of the same and India did not make judicious use of whatever little fell their way, another important distinction with elite teams, who feel the need to be clinical on the worst of their days. Jeje Lalpekhlua was introduced at half-time for Ashique Kuruniyan, but produced the type of laboured performance that we have come to see from him in this Indian Super League season. India could feel the noose tightening, yet could do very little at the time to prevent the rope being girdled. They were over-run by Bahrain, as every clearance was aimed towards their goal, but barely reached their defenders on the half-line, sparking a brand new attack. Thapa was finally introduced for Halicharan Narzary but India were being over-run by this point, and his best efforts proved futile to stop it. A back-pass to Sandhu by Subhasish Bose was deemed intentional, and India narrowly survived an indirect free-kick within the box. Bahrain then hit the post, as India appeared to be running on empty. In the end, pressure told as a shot deflected to a Bahrain player on the edge of the box and Halder committed rashly, giving away a penalty. Jamal Rashed made no mistake with the spot-kick, burying India with four minutes to go. The final few seconds of the match were as panic-driven as the previous lot, as India meekly limped to defeat. With the UAE getting a draw against Thailand, it was all over for Constantine’s men and Constantine himself, who resigned in the post-match press conference. The fall-out will continue for days to come, but for now, it is over. Finito. A new man will come in and new promises will be made. The class of 2019, however, will look back at their final group stage performance, with dismay and wonder whether things could have been different if they had decided to take a different tactical approach. For now, that’s all they can do.